The World AIDS Museum is putting on an important event tomorrow night, April 28, 2016. Volunteers are needed to help from 12 noon to 4 pm OR for event set up from 6 pm to 9:30 pm. Come and bear witness at this moving and powerful exhibition. Hear stories from filmed interviews with nearly twenty members of the Black community who live with or are deeply affected by HIV. Noted San Francisco photographer, Duane Cramer, joins us, displaying photographs and stories of nearly forty other individuals. Some are famous, some are local; some infected, some affected. The exhibit will also feature HIV/AIDS-inspired poetry and art by local Black artists and writers, and a family tree illustrating the profound and far-reaching effects of HIV/AIDS on families. 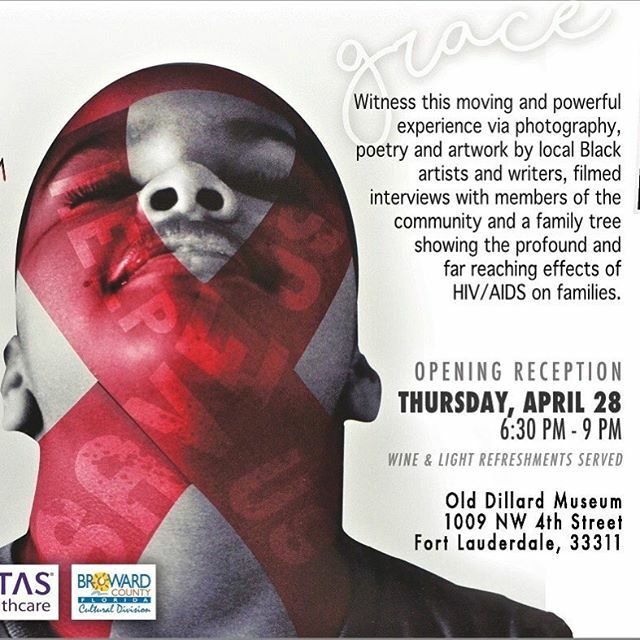 This exhibit and opening reception takes place at the Old Dillard Museum in Fort Lauderdale’s Sistrunk district, where five members of the Black HIV/AIDS Community will be honored with the Saving Grace Award, sponsored by Vitas Healthcare. Wine and light refreshments will be served. Admission: A donation of $5.00 is requested to support the Old Dillard Museum.